This is the time of year when we’re all thinking about what we’re giving to friends and family. Especially this year, when most of us are being more thoughtful about what it is we’re giving. Since my job duties entail the registration and processing of donations to the museum’s collections, I encounter gift giving all year long. But especially at the end of the year and this month has kept me busy! Currently, I’m plowing through recent donations of things as varied as Amazonian spears to a swan specimen to Native American pueblo pottery. All of these donations will enhance our collections and all of us in the Collections Department are most appreciative of our generous donors. However, these are the most recent acquisitions. 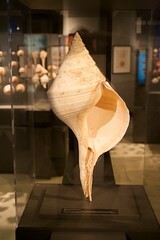 The Houston Museum of Natural Science wouldn’t be where it is today without nearly a century of far-sighted people who generously and intelligently gave entire collections of natural specimens and cultural artifacts. They entrusted things they had collected with passion and zeal to a museum that was just beginning to grow so that Houstonians could learn about the natural world around them. In the coming year of 2009, as the museum celebrates its centennial, you’ll hear more about the names of Attwater, Westheimer, Milsaps, McDannald but their generosity was the foundation of the museum’s collections. And that’s what it takes – generosity. I wonder what our past donors would think of today’s natural history auction market? 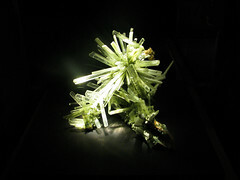 Fossils and minerals can fetch exorbitant prices, far more than most museums can ever pay. Would those long ago donors who thought so highly of museums as institutions for the public approve of specimens and artifacts staying in the private hands of the highest bidder? After all, these early naturalists, amateur and professional, were often wealthy and acute businessmen themselves. But they did give and the museum has been fortunate that that kind of generosity has prevailed for a century. Indeed, it continues today and our collections continue to grow. So, I’ll continue to measure and count amazing artifacts and specimens and make sure each donor is properly acknowledged. It’s just my small part in witnessing how the thoughtful generosity of our donors makes the museum a better place for us all. Despite many childhood visits to HMNS, Donna was clueless that she would have a career here as a registrar instead of as a world famous ballerina. She has worked so long in the Collections Department that it must be more than a quirky, passing phase. When not processing new acquisitions into the permanent collections, peppering the curators with questions, or making people put on gloves, Donna can be found in a dance class, a bell tower, at a dance performance, or reading a book.